Italian premier Matteo Renzi speaks eloquently on the issue of the Migrant crisis to the Guardian UK. Milazzo has a shelter for boys, mostly aged 18-20. I know the people who run it and several of the boys have worked for us at the restaurant under social projects. I know they are well-provided for at the shelter, with "tutors" or psychologists, and money to buy food etc. I wanted to speak to them about their experience but was afraid they would get upset. However, yesterday Emilia from Oxfam GB came by to interview some of them. Her questions were well-phrased and not too personal so the boys responded briefly without getting upset. I sat with two boys from Mali when they spoke in case they needed translation from French. I was struck by how much they spoke about their family back home and how they feel a loss of identity in coming here. "No one knows me here, no one knows my family," said Issa. With a smile he nodded at me and mio marito and said, "Now I know you." Issa wears an amulet around his neck. When I asked him if his mother gave it to him he nodded, eyes full of tears: for protection and luck. Modou from Gambia also works for us. He already has refugee status because his family was persectued by brutal dictator Yayhah Jammeh, in power for twenty years. He told me the real story of weeks of travelling from Gambia to Niger to Libya. Of the fear in Libya where he saw people get killed for the first time. The driver who left him at the border to Libya said: Don't look at an Arab woman or you will get shot. Don't say anything when they mistreat women and children, or they will kill you. Don't volunteer to navigate or captain the boat (for free passage) because when they discover you can't do it, they will kill you." In Libya for three weeks waiting to travel, he only left the holding centre to get food because of the danger of being assaulted by truckloads of "soldiers". "We are all ex-soldiers from the Gaddaffi regime," the human-traffickers told them. They take women and lock them in a room, then call their friends. "We have African women here," they say, and charge a fee. When I asked him about treatment of children, Modou wouldn't tell me. "Libya is a crazy place," he said. When at last his turn to sail came, they were given a sat-nav and nautical directions, and a mobile phone to keep in touch with the people-traffickers. "When you are three hours away from Italy, we will give you the number of the Italian coast guard," they said. "You must then throw all sateliite equipment into the sea so they don't know where the boat comes from." Modou knows that Europe doesn't want African migrants. But, he says, "There are thousands of Africans waiting for good weather to travel to Italy." 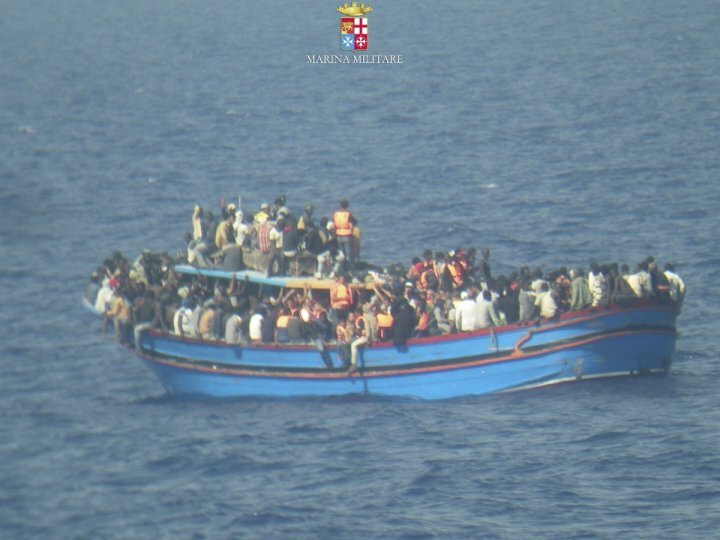 As Renzi says, the history of humanity has been marked by migration flows... Europe needs a management strategy for the arrival and distribution of the migrants and also, most importantly, needs to address the underlying problems in the African countries from where they come, Libya included. Easier said than done, but this is a humanitarian emergency that is not being treated as such. The way these youngsters smile, you would never imagine their epic journey to Sicily via the harrowing hell experience of Libya. Barely eighteen, they are fleeing persecution under the Gambian regime of dictator Yayhah Jammeh, and post-war chaos in Mali and Sudan. They pay around €600 to travel from Libya to Sicily. The price of human life in so many cases.